Boyd Family Vineyards is a botique winery offering very limited production hand crafted wines. Annual production is approximately 2000 cases across 8 wines. 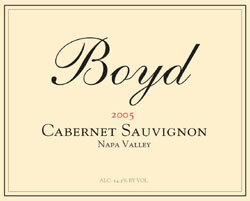 To join the wine club, visit www.boydwine.com or call 707-254-7353. Members receive two 12 bottle shipments annually and receive a 15% discount on all wines.